First timers learn to ski or snowboard on our sunny sheltered Learners' slope and we GUARANTEE no more than 5 children or 8 adults in your first lesson! How's that for treating you as a person rather than a number! Just an integral part of our teaching culture here at TC. Group Lessons offer ski and snowboard options for all levels going out twice daily at 10.30am and 1.30pm. Private lessons for personalised ski and snowboard improvement can be booked at your convenience throughout the day with excellent deals on sunrise rates. Children's ski and snowboard lessons are always fun and often made special with a visit from TC Cat. 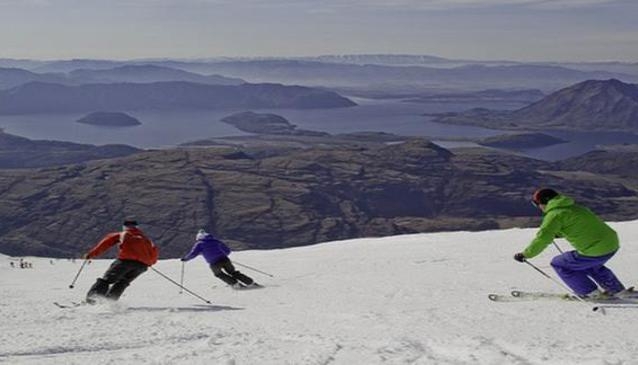 With a lot of mountain to explore, Treble Cone is the ideal place for week long ski improvement weeks, offering a series of adult ski lessons that really take your skiing further. There are also two weeks dedicated to Ladies ski and board improvement and the intensive Treble Cone Sofa Ski School Camp.